Bold purple tubular flowers adorn the stems of this hummingbird-magnet. The deep purple bloom clusters are a sight to behold and it will flower steadily from early spring all the way until frost. 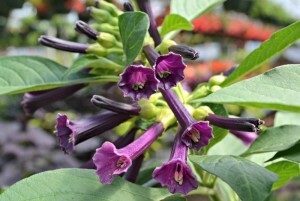 The plant has large, velvety leaves and usually reaches between 3’-5’ tall by 4’wide. In the same family as the Angel Trumpet, Iochromas are sometimes called “Mini Angel Trumpets,” and they have similar cultural requirements: full sun, well-drained soil and fertilization every couple of weeks during the growing season to encourage continual blooming. Once established this fast growing beauty will reach its maximum size in about a month’s time. 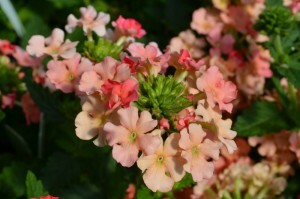 Verbena Lanai® Peach offers a unique light peach color to the series. In the garden it has proven to be one of the best trailing verbenas at a height of 6”-8” tall by 24”-30” wide, rivaling even verbena ‘homestead purple’. Lanai® Peach flowers early and is free flowering from tip to crown, on old growth and new growth alike. Typically an annual, this particular variety has made it through the past two winters in the garden. Although we will still carry this verbena as an annual you can expect it to be marginally hardy. This beautiful foliage plant has made our top 10 list for both annuals and houseplants the past few years. It is extremely durable in both the ground and in containers, taking anywhere from full shade to full sun. 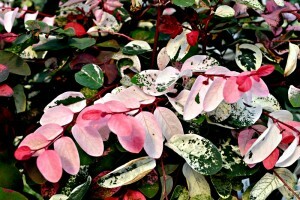 Although you will receive the best coloration in partial sun, even in full shade the beautiful pink, white, and dark green foliage will brighten up any garden or home. Unfortunately, the Hawaiian Snowbush is an annual in our climate, but it does just fine if brought indoors in the winter as a houseplant. This way, you can enjoy the color year round. Fertilize every couple of weeks and prune to shape as needed and this excellent choice will become a new favorite in your garden and home. Unlike most fuchsias, Gartenmeister Upright Fuchsia thrives in the heat and humidity that we have in North Carolina. Boasting unique pink/orange clusters of tubular flowers on 1’-3’ tall upright stems, this is a hot item among hummingbirds. Blooming from early spring all the way to frost, you couldn’t ask for a better performance of color. 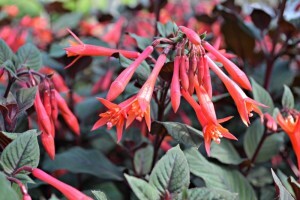 Give Gartenmeister Upright Fuchsia either full shade or morning sun, fertilize every couple of weeks and watch the symphony of hummingbirds all year long. This extremely hard to find Penta is nearly one of a kind. It reaches between 3’-4’ tall and wide in large containers or in the garden, and blooms constantly light red from spring through fall. Dead heading promotes a more vigorous flower show but is not necessary. 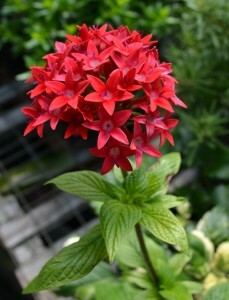 Being a Penta, the Giant Red Penta attracts both hummingbirds and butterflies with its large clusters of tubular blooms. An excellent heat and full sun lover, keep watered regularly and fertilize every couple of weeks. This unique beauty will become a must have in your garden for many years to come. We have always been a huge fan of Blue Daze here at Fairview. 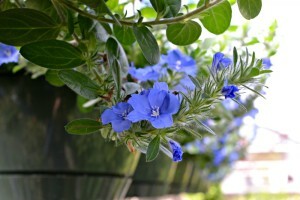 Beautiful, bright blue flowers are eye catching in any part sun to full sun location. Blew My Mind™ Blue Daze is Proven Winners newest version of Blue Daze which stays more compact at 6”-12” tall and 24” wide, and produces twice as many flowers that are even larger than other cultivars. Keep well watered during the summer months and fertilize every other week to keep this new variety looking its best. Excellent alone in hanging baskets or paired together with other part sun to full sun annuals this beauty is the perfect trailing flower in any container or garden. Jo Ann has a particular favorite in her garden each year that seems to amaze everyone who visits Fairview. 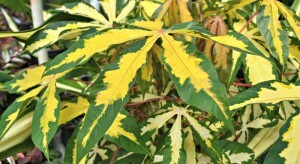 Producing an array of variegated green, yellow and red foliage, the Variegated Tapioca (Manihot esculenta ‘Variegata’) matures to between 4’-6’ tall by 4’ wide within a couple of months. Related to the actual Tapioca that your pudding is made from, the Variegated Tapioca is not edible, but makes up for it in beauty. This full sun tropical is a must have for any plant collector and makes the perfect annual for height in both containers and in the ground. Just keep the Variegated Tapioca well watered, and fertilize every other week and you will be amazed at this unique one of a kind tropical that all your friends and neighbors will be asking you about. Mandevilla, the beautiful, vining garden favorite that you’re used to seeing in shades of pink and white, actually comes in a hard to find yellow that grows just as fast and full as the other colors. 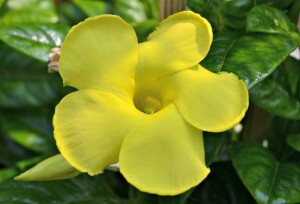 Dark, glossy green foliage is an excellent contrast to the vibrant yellow flowers on the Yellow Mandevilla. Hummingbirds flock to the bright yellow flowers from spring through fall. Vining from between 6’-8’ tall, keep this tropical vine watered well in full sun and fertilize every other week to keep it in constant flower. Few shade plants produce such a vibrant array of purple and dark pink salvia-like blossoms all spring and fall like that of Mona Lavender. Closely related to Swedish ivy, this small shrub-like annual has excellent dark purple foliage that contrasts the beautiful flowers. 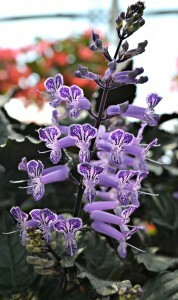 Growing from 12”-24” tall and wide, the flowers on this shade lover attracts hummingbirds and butterflies. A great addition to any shade container or flower bed, keep well watered and fertilize every other week to keep full and flowering. This versatile vine is arguably the most adaptive annual that we carry at Fairview. An excellent full sun flower, but can also take full shade and it will still produce flowers. During the winter it can be brought indoors as an easy to care for houseplant. Fast growing to 4’ tall this unique vine flowers on a regular basis, no deadheading necessary. Keep well watered and fertilize every other week to produce a full flowering thick vine. Excellent as a filler or spiller in any container. This vine does prefer to be used in a container, if planting in the ground make sure to amend your soil with our Pete’s Planting Mix to accommodate its nutrient and moisture needs. 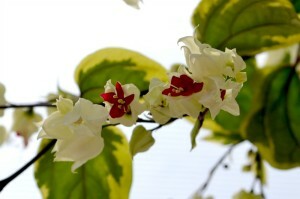 Be sure to visit our greenhouse and or display garden to see how well these beauties look throughout the year. If you have any questions feel free to give us a call at anytime, we are here to help.